We have lots of great events planned (see Programs & events) and our Spring Native Plant Sale is going on right now. Please view or download the file below and check out the selections. Check Out All of Our Upcoming Events ! We want to hear from our community! 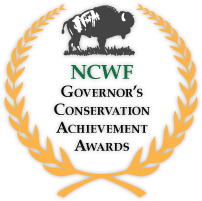 We are very excited to announce the City of Concord as the North Carolina Wildlife Federation’s 55th Annual Governor’s Conservation Achievement Award Winner for Municipal Conservationist of the Year! Thanks to everyone who has contributed to this achievement. Visit the link below to see the other winners. Concord Wildlife Alliance proudly serves the City of Concord, North Carolina. As result of our formation the area now has a collective voice in helping preserve, protect, enhancing the natural and wildlife habitats, and species that are a key part of this city. If you would like to become a member or see how you can help, please contact us.